Fascinated by the dynamics of shapes, Saint Honoré has succeeded in squaring the circle with a bold 44 mm model featuring a streamlined and trendy case creating a maximum depth effect and ensuring a perfect fit. Masculine and contemporary by nature, the Coloseo is distinguished by several subtle aesthetic and technical details including integrated crown guards, comfortable sloping lugs, a chronograph and a large date. 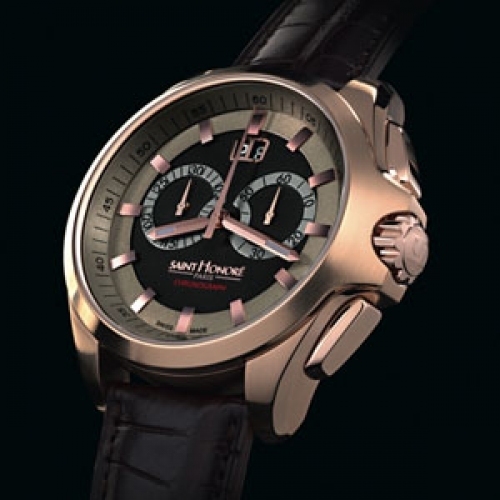 An ideal blend of elegance, functionality and readability expressing a determination to focus on essentials as revealed by the inimitable Saint Honoré expertise.